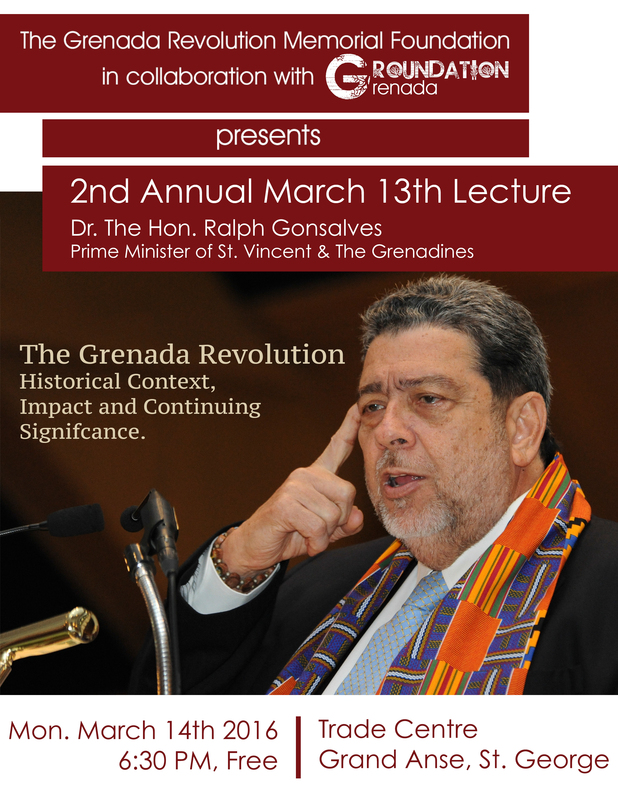 Dr Ralph Gonsalves, Prime Minister of St Vincent & the Grenadines, will deliver the Second (2nd) Annual March 13 Lecture at the Grenada Trade Centre on Monday, March 14th, 2016 starting at 6.30pm. The topic for this year’s lecture is “The Grenada Revolution: Historical Context, Impact and Continuing Significance”. March 13th, 2016 marks the 37th Anniversary of the Grenada Revolution. Students of history are especially encouraged to attend the upcoming lecture which focuses on a critical period of Grenada’s development. An articulate and persuasive speaker, Dr Gonsalves is a seasoned politician, historian and Attorney-at-Law. He holds a BSc in Economics, and an MSc and PHd in Government. He has authored several books and pamphlets touching and concerning history, politics and developmental issues. This collaboration is part of Groundation Grenada’s ongoing cultural memory project Forgetting is Not an Option, which seeks to engage with the Grenada Revolution as a launchpad for envisioning social change within a contemporary context.